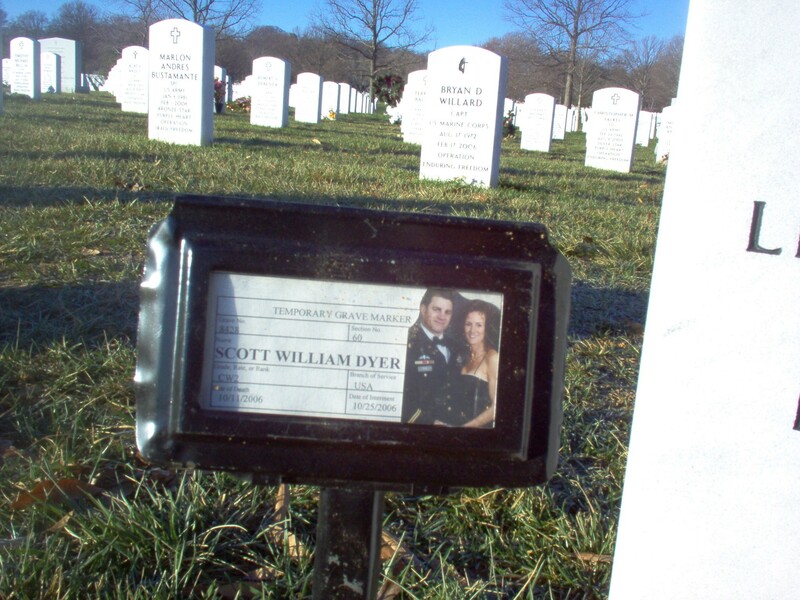 Chief Warrant Officer Scott W. Dyer, 38, of Cocoa Beach, Florida, died October 11, 2006, in Banditemur, Afghanistan, from injuries suffered during combat operations. 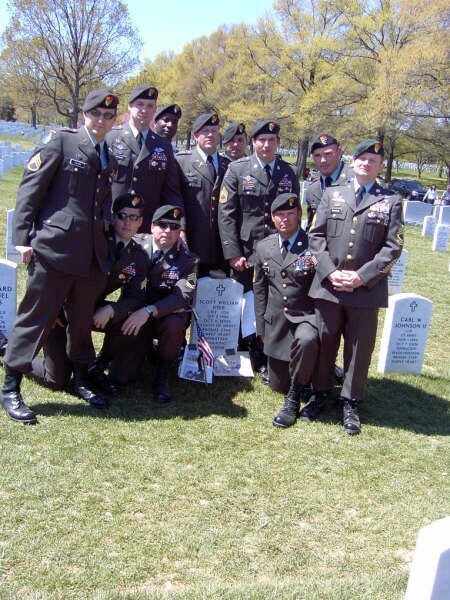 Dyer was assigned to the 3rd Battalion, 3rd Special Forces Group, Fort Bragg, North Carolina. For further information related to this release the media can contact the U.S. Army Special Operations Command public affairs office at (910) 432-6005. FORT BRAGG, N.C. (USASOC News Service, October 13, 2006) — An Army Special Forces Soldier stationed here died Oct. 11, in southern Afghanistan while deployed in support of combat operations. CW2 Scott W. Dyer, 38, an assistant detachment commander, assigned to 3rd Battalion, 3rd Special Forces Group here, died from injuries sustained in support of combat operations. He deployed in support of Operation Enduring Freedom in August 2006. A native of Titusville, Florida, Dyer enlisted in the Army November 11, 1987, as a cavalry scout. After completing basic and advanced individual training at Fort Knox, Kentucky, he was assigned to the Joint Readiness Training Center at Fort Polk, Louisiana. In 1993, Dyer volunteered for Special Forces training and upon completion of the Special Forces Qualification Course he was assigned to 3rd SFG as a Special Forces engineer. He served with the 3rd SFG until January 2002 when he was assigned to the 96th Civil Affairs Battalion, here, as a civil affairs engineer. In 2003, Dyer volunteered to attend Warrant Officer’s Candidate School and graduated in June of that year. He was reassigned to the 3rd SFG in February 2004 as an assistant detachment commander. His awards and decorations include the Meritorious Service Medal, Army Commendation Medal, Army Achievement Medal, Good Conduct Medal, National Defense Service Medal, Afghanistan Campaign Medal, Global War on Terrorism Expeditionary Medal, Global War on Terrorism Service Medal, Armed Forces Service Medal, Humanitarian Service Medal, NCO Professional Development Ribbon, Army Service Ribbon, Combat Infantry Badge, Master Parachutist Badge, Military Freefall Jumpmaster Badge, Military Freefall Parachutist Badge, Air Assault Badge, Ranger Tab and the Special Forces Tab. His posthumous awards include the Bronze Star Medal for valor, and the Purple Heart. Dyer is survived by his wife Jodi, son Casey, daughter Sidney, mother Sandra Miller and step-father Steve Miller of Tequesta, Florida, father Carl Dyer of Alexandria, Virginia, and sisters Tawnia Peterson of Orlando, Florida, and Dawn Hill of Rockledge, Florida. Army Special Forces soldier Scott William Dyer died smiling this week in a helicopter high above the mountains of southern Afghanistan, his mother said Friday. Dyer had been struck by heavy fire Wednesday. His men tried to save him by pulling his wounded body onto the aircraft. But it was too late. As Dyer's Captain took his hand, the soldier looked up, smiled and slipped away. He was 38. "He lived life, every second, up until his death," his mother, Sandy Miller, said Friday. "We were so proud of him," she said. Dyer is the 26th Floridian to die in Afghanistan during Operation Enduring Freedom. Raised in Brevard County, Dyer was a chief warrant officer assigned to the 3rd Battalion, 3rd Special Forces Group out of Fort Bragg, North Carolina. 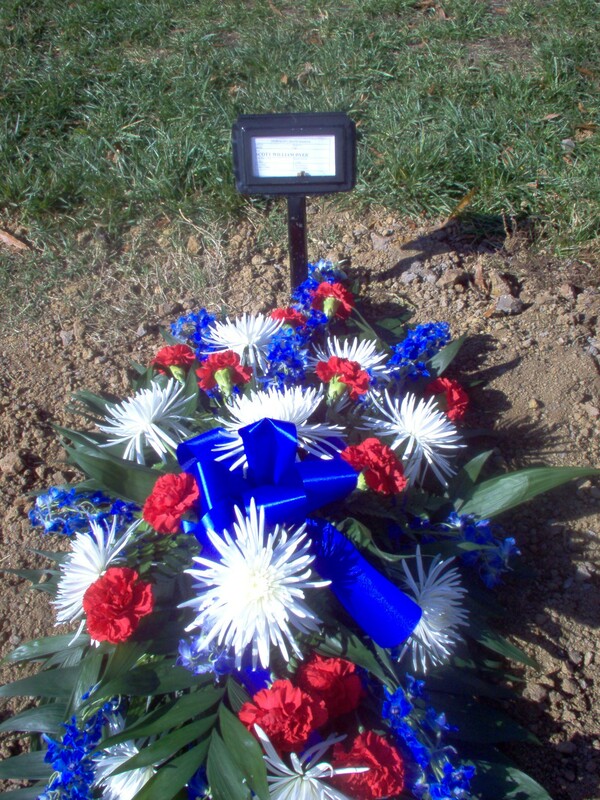 He received numerous awards before his death and was posthumously awarded a Purple Heart and Bronze Star for valor. His funeral will be at Arlington National Cemetery. In addition to Miller, Dyer is survived by wife Jodi, 37, and their children, Casey, 10, and Sidney, 6, of Sanford, North Carolina; and sisters Tawnie Peterson of Chuluota and Dawn Hill of Rockledge. Dyer grew up in Port St. John, where Miller and her children moved after she divorced. There, they were close to Dyer's grandfather, a World War II Navy veteran who worked in the space industry. He told the boy about his wartime adventures. When Dyer was 5, he told his mother his future was set. "There were two things he was going to do: He was going to be a soldier and ride a motorcycle," Miller said. "He later added, 'Jump out of airplanes,' " she said. Life was pleasant on the Brevard coast, Miller said, and Dyer threw himself into it. As a student at Titusville High School, he was on the football, wrestling and track teams. He could have attended college on a wrestling scholarship but decided against it, his mother said. One week after Dyer's 1987 graduation, he signed up for the Army as a cavalry scout. 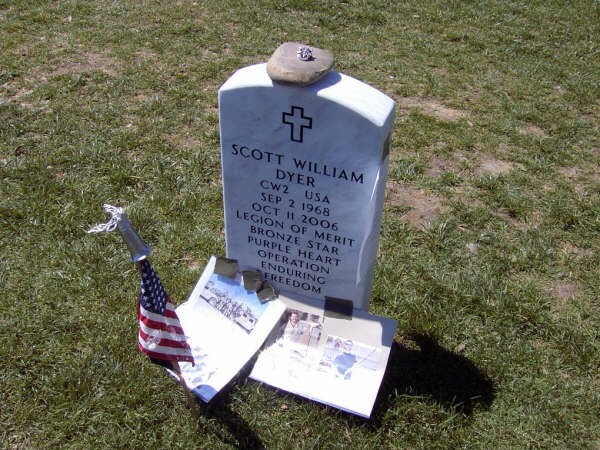 Dyer was an athletic man, and the military suited him well. 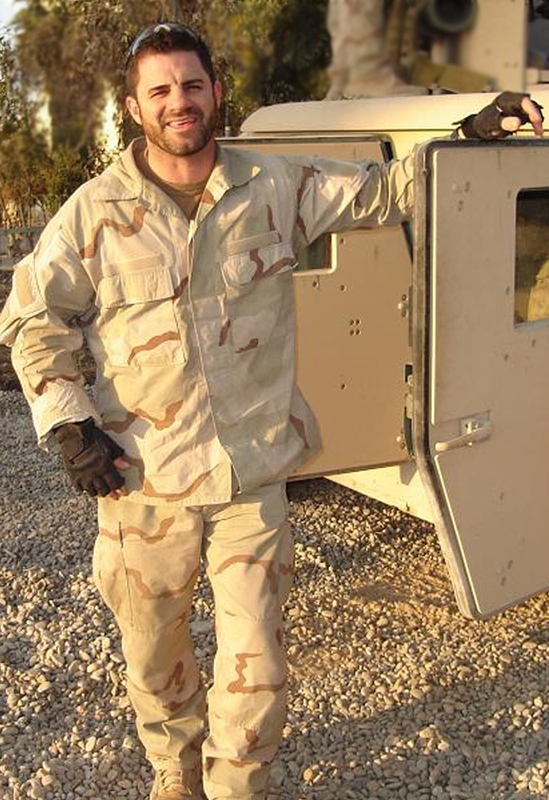 He graduated at the top of his Army Ranger class, Miller said, and volunteered for Special Forces in 1993. "He was proud of what he did," Miller said. Even as opinion soured on American involvement in Iraq and Afghanistan, he told Miller the conflict was the only way to stop terrorists from attacking the U.S., she said. He also believed in family. He met Jodi while he was assigned to Fort Smith, Arkansas, and knew immediately they would fall in love, Miller said. They married in 1989 at Cherry Down Park in Cape Canaveral. It took hard work for Dyer to balance his love of family and the Army, Miller said, but he did it. When he was at his Sanford, NorthCarolina, home, he coached his children's sports teams and took them and their friends wakeboarding often. They took family trips to Hawaii and Alaska. When he was in Iraq or Afghanistan, he talked to his children every day using the Internet and a Web camera -- even on the day he died, Miller said. It happened after nightfall, Jodi and others told Miller. His team was hovering in a helicopter above a mountaintop. Dyer was the first to jump out. Ground fire hit him. His men pulled him back inside for safety, but he was already too badly injured. Hours later, Miller got a call at her home in Jupiter. "Mom, Scott has passed," Jodi told Miller. Within minutes, Miller was driving to North Carolina to prepare to bury her son. Sandy Miller of Tequesta watched her grandson, Casey Dyer, on Saturday as his mother, Jodi attached the Special Forces emblem to his football helmet, then the fathers of his teammates marched onto the field to put emblems on their helmets as well. It was a small step of "normalcy" for the 10-year-old, whose father, Scott Dyer, 38, had died Wednesday in Afghanistan, after his Black Hawk helicopter was under small arms fire. 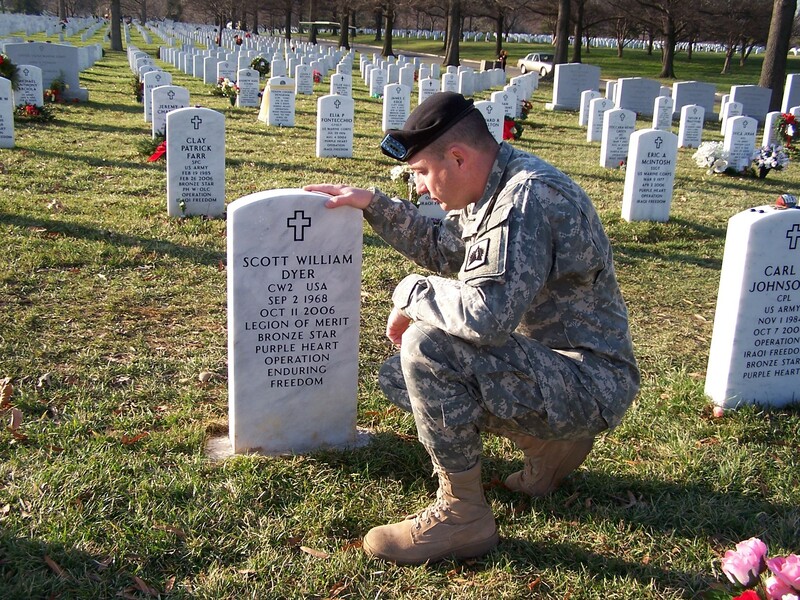 Miller's son, Scott, was on his third tour of Afghanistan when he was killed. An Army Ranger, a member of the Special Forces and one of the elite who did high-altitude sky-diving, Dyer was a 19-year military veteran. 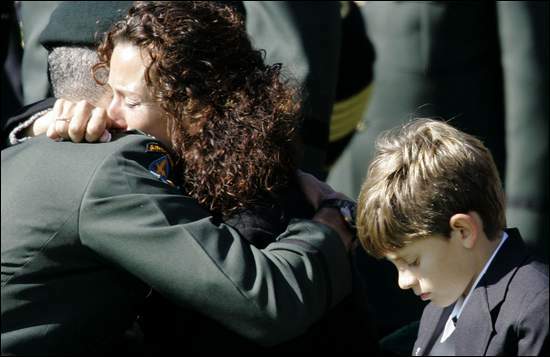 "He has a wonderful legacy," said Miller from Dyer's family home in Sanford, North Carolina, near Fort Bragg. "He was an honor graduate of the Ranger class of July 1992, graduated from Special Forces in 1993 and was an honor graduate of the Warrant Officer class three years ago," Miller said. "I'm hearing stories of this fantastic person. We had so many people telling us what we call the 'Scott stories,' and last night we were outside by the lake with a case of beer telling Scott stories until 2 in the morning." Miller said she received a phone call from Afghanistan Tuesday, telling her that the rampside ceremony, where the military loads the coffin of the soldier onto the plane to bring it home, had 500 people there. "This was at 11 at night," she said. "There were people from every nation fighting with them, and Scott and I used to talk on Yahoo three or four times a week via a webcam and he'd tell me how great the Swedes were or the English. And they were there at rampside for him." A memorial service is scheduled at Fort Bragg's JFK Chapel on Thursday. 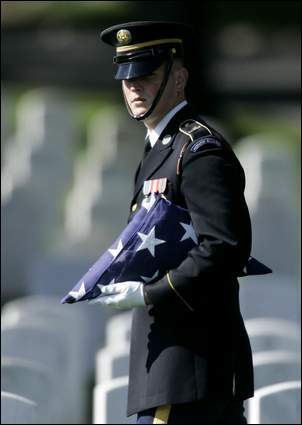 Scott's coffin is in Washington, awaiting burial at Arlington National Cemetery, he mother said. The two services will be marking the life of a man that his mother called "my best friend and the number one father in the whole world." Giving the eulogy at the Thursday memorial service will be Rick Fritps, a fellow warrant officer, who was also a classmate of Dyer's when they both went to Titusville High School. Dyer's daughter, Sidney, 6, will be singing a song at her father's service. "There's a contingent of 14 of his friends from Titusville coming to Fort Bragg for the memorial," said Miller. 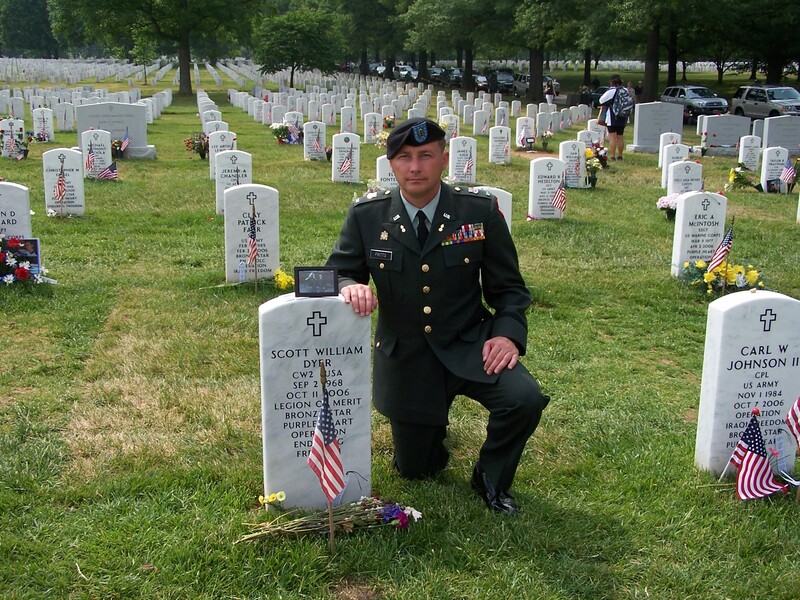 "Scott was in the service for 19 years, and he made the most incredible friends. We've had calls from Iraq, Afghanistan, Japan, Nigeria, everywhere he's been. They are coming in by the hour and by the day. The outpouring of love and support from Titusville and around the world is wonderful." Neighbors in the Miller's Tequesta neighborhood are now trying to coordinate an effort to put flags along the Miller's street in time for the 10 a.m. memorial on Thursday, as a show of their support for the family. Miller has high praise for Dyer's wife, Jodi. "These military wives of husbands in the Special Forces who are deployed, they know their husbands will be out of the country all they time. What a wonderful crew of women they are and what a remarkable woman my daughter-in-law is. "Sidney, at 6, is outgoing and doesn't really understand yet what this means. Casey is quiet, and he played ball on Saturday and his mother sent him back to school on Monday. We felt is was best that he begin to have a return of a little normalcy in his life." In addition to his wife, Jodi, and children, Casey and Sidney, Dyer is survived by his mother and stepfather, Sandy and Steve Miller of Tequesta; his father, Carl of Alexandria, Virginia; and his two sisters, Tawnia Peterson of Oveido and her husband Chris and Dawn Hill of Rockledge, and her husband Michael. The memorial service for Scott Dyer will be Thursday at 10 a.m. in Fort Bragg. 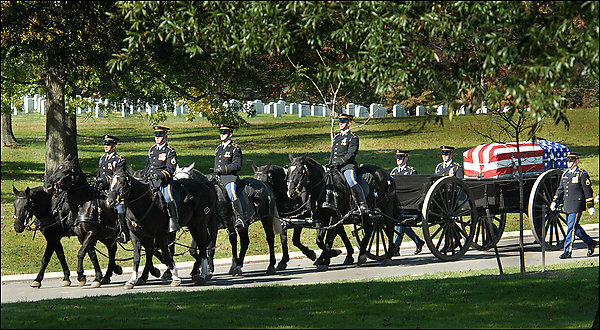 Graveside services will be at 1 p.m. October 26, 2006, at Arlington National Cemetery, with the full military honors, including a horse-drawn caisson, bagpipe, 21-gun salute and "Taps." "What is funny is that Scott didn't like horses, and here he will be at Arlington in a horse-drawn carriage," he mother said. When he was home on leave, Dyer spent time helping to rebuild basketball courts and other children's recreational amenities in the neighborhood, according to Miller. Because of this devotion to children's recreation, in lieu of flowers, donations should be sent to the Scott Dyer Memorial Fund for the Children's Recreation Committee of Carolina Lakes Property Owners Association, 91 Clubhouse Drive, Sandford, N.C. 27332. Even though he was 7,000 miles away, Army Chief Warrant Officer Scott W. Dyer made his family a priority. He spoke with his wife, Jodi, and their children, Casey, 10, and Sidney, 6, via webcam every chance he got. "We'd look at each other on the computer and make faces and make each other laugh," said Jodi Dyer, whose husband was on his second tour in Afghanistan. Dyer, of Cocoa Beach, Florida, died October 11, 2006, from injuries he suffered jumping from a helicopter during combat in Banditemur, Afghanistan. He was 38. Yesterday, hundreds of mourners -- many in uniform -- gathered at Arlington National Cemetery to pay respects to the loyal friend, father and son. 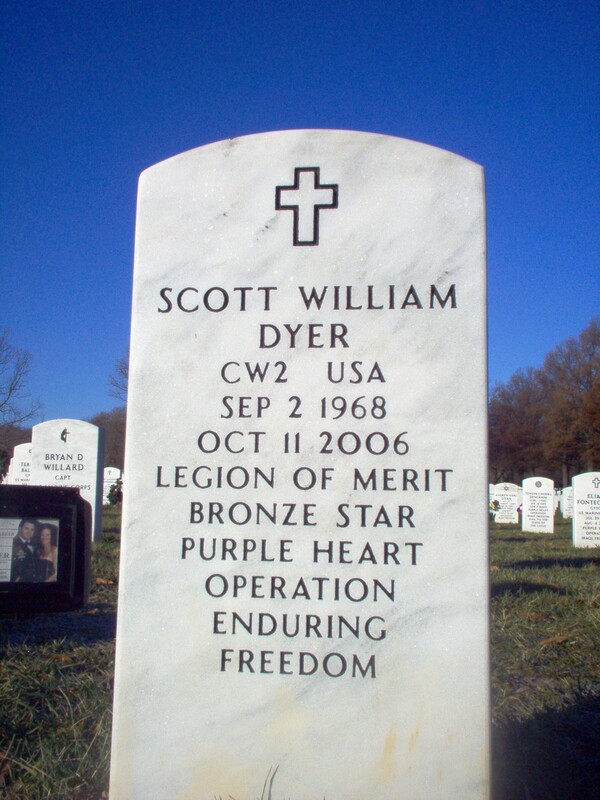 Dyer was the 41st person killed supporting Operation Enduring Freedom to be buried at Arlington. A military band led the procession through the blustery wind to the grave site, where a chaplain delivered a sermon. A brigadier general presented U.S. flags to Dyer's wife; his mother, Sandy Miller; and his father, Carl Dyer. 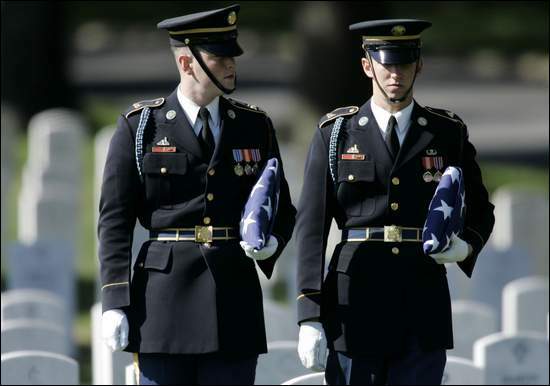 Mourners wiped their eyes as a bugler, standing among the rows of white headstones, played taps. Dyer was assigned to the 3rd Battalion, 3rd Special Forces Group, at Fort Bragg, N.C. Almost 400 people, including friends from grade school and high school, had packed the John F. Kennedy Memorial Chapel at Fort Bragg last week for a memorial service for Dyer. An additional 500 stood outside in tents. "Every friend he made he kept for life," his wife said. "He would get on the phone and talk to his friends for hours, saying he would make dinner for me, but he never would." Since his death, scores of friends have posted comments in an online memory book. Mark Kenda of Clearwater, Florida, said he had been friends with Dyer since seventh grade. "He has paid the ultimate sacrifice to make this world a better place for those who remain," Kenda wrote. 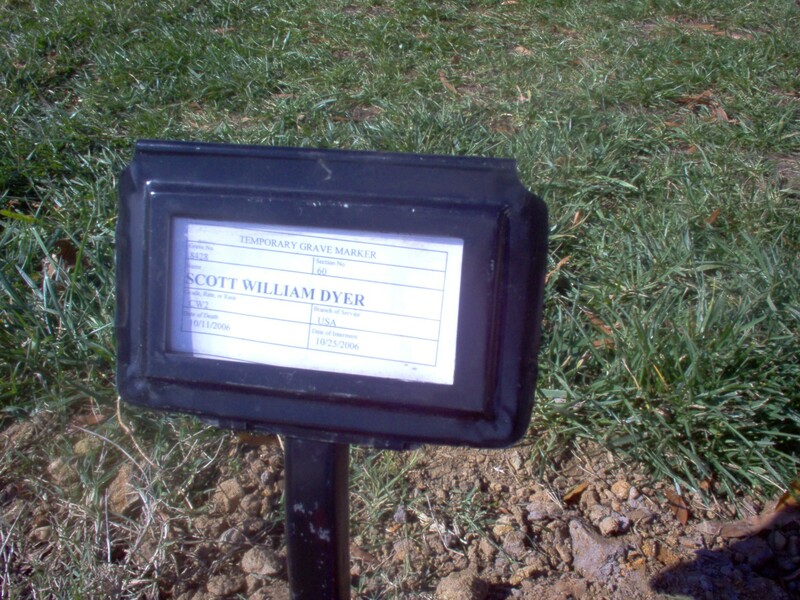 "I was fortunate enough to be able to call Scott my friend." Dyer's 19-year military career took him to assignments in Africa, Haiti and Bosnia, and twice to Iraq. He received many awards and decorations, including the Bronze Star, Purple Heart, Meritorious Service Medal and Humanitarian Service Medal. As a member of the Special Forces, or Green Berets, he was trained to jump from helicopters at high altitudes, his wife said. He also learned French Creole and Arabic, and used the latter in Afghanistan to help train local troops. "When he was over there, he said he was making a difference," Jodi Dyer said. "They were making gains, and he was just hoping that eventually they could pull out and the Afghans could take care of themselves." When Dyer wasn't on assignment, he coached his kids' basketball, soccer and baseball teams, his wife said. The last time they spoke on the phone, he had just returned from a mission and was exhausted, she said. But his spirits lifted when she told him their son had won his football game. 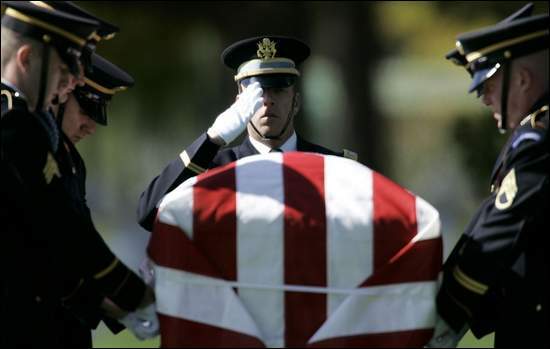 He was up for reenlistment in two years, his wife said. "He was going to reenlist, but he didn't want to miss another football game or another graduation," she said. "He was 100 percent ready to spend time with his kids." Arlington National Cemetery, Wednesday, October 25, 2006.
at Arlington National Cemetery, Wednesday, October 25, 2006.
widow, Jodi Dyer, and their children, Sidney, 6, and Casey, 10. 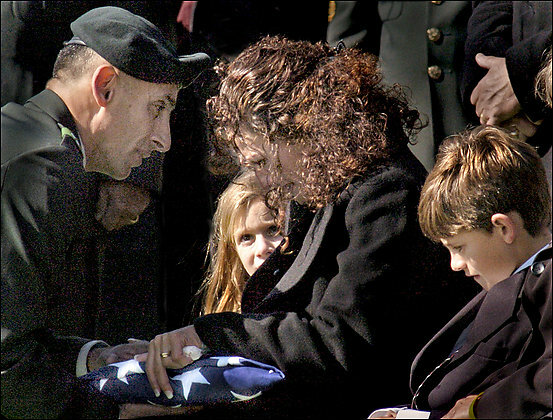 Dyer, of Titusville, Florida, during funeral services at Arlington National Cemetery, Wednesday, October 25, 2006.